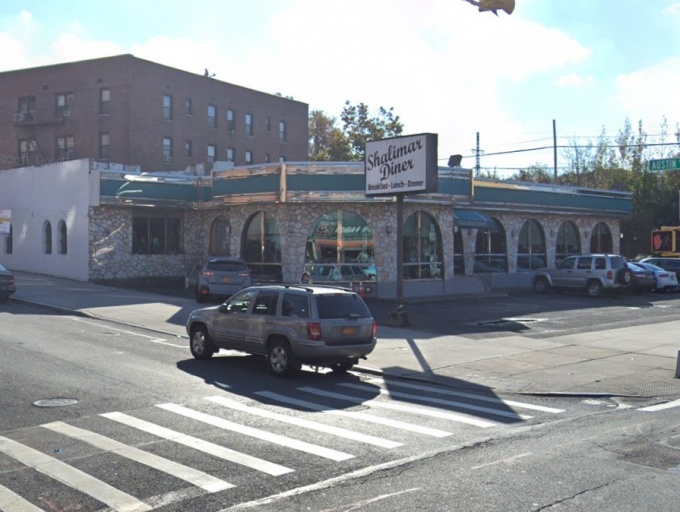 The now-shuttered Shalimar Diner is about to face the wrecking ball. The property owner, Arthur Koptiev of 63-38 Austin LLC, filed plans on March 15 to demolish the one-story structure. The property was purchased in November by Koptiev’s firm for $6.55 million, according to city records. Koptiev said that he is demolishing the building to reduce his liability issues, and that he doesn’t have any plans yet for the site. No plans have been filed with the Dept. of Buildings. The 14,000 square foot lot has 140 feet of frontage along 63rd Drive, and 100 feet of frontage on Austin Street that includes the parking lot next to the diner. It is zoned R4 residential with a C2-2 commercial overlay, which allows Koptiev’s firm to build a structure up to twice the size of the lot with a “community facility bonus” included. The diner closed amid a decline in business and a hike in rent. Demi Karayiannis, who owned the Shalimar with her husband since 1974, said at the time it closed that the changing neighborhood was another factor. The real problem is that change is inevitable. Everyone wishes we can keep things the way they were. That (sadly) is not realistic. Do NOT build bike lanes. They are rarely used, mostly by delivery people, and make it much more difficult to move by car from the main road to the service road, as one has to twist one’s neck in order to make sure no one is in the bike lane. Of course, having fewer parking spaces also impacts business. In my opinion, it makes crossing the street more, not less, difficult. Iconic seems like a strong word for a diner. In the past few months, I’ve seen articles about diners closing in Bay Terrace, Elmhurst, and Rego Park. All of these articles talk about changing populations, changing tastes in food and restaurant exprerience, and rising rents. Yet somehow, when Ben’s Diner in Rego Park was closing, local opponents of the safety improvements on Queens Blvd asserted– very often, very loudly, and very insistently– that Ben’s was closing because the city had inflicted a bike lane on Queens Blvd. I hope we all see this now as the lie it has always been. The bike lanes & other safety measures on Queens Blvd have saved lives and provided a new way for emergency vehicles to bypass traffic congestion on the Boulevard. Those safety improvements should be celebrated. Not true. These bike lanes that are used primarily by bike messengers, when they’re not using the sidewalk, are absolutely hurting businesses and decreasing the already scarce number of parking spots. There are parks for bike riding. Koptiev? Another Russian ruining the neighborhood the way Forest Hills/Jewel Avenue area has been destroyed. People miss Shalimar, the people and the food. It’s disgusting that there will probably be ANOTHER residential building there! We don’t need any more people in Queens!!! Too bad local politicians didn’t fight for this the way they’re fighting over Amazon. Small businesses not companies run by billionaires built this city.